My favorite flower is the Gerbera Daisy too... so if Brooks gets me flowers he can then lend them to Blake and then he can give them to you or vice versa... you know kill two birds with one stone. I guess it stinks for the person getting seconds... Second flowers aren't usually pretty. Just think about it though! Thanks for sharing your favorite things. 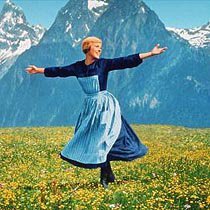 Speaking of the Sound of Music selection, Grandma Jeane used to sing that song all the time, including performing the number at various gatherings.